Yellow Towel has become something of a signature piece for the Montreal-based Dana Michel. "This is my black piece," Dana Michel explains with a resigned laugh. "I realized: I'm going to say the word black out loud. I'm going to say that I'm a black person out loud." 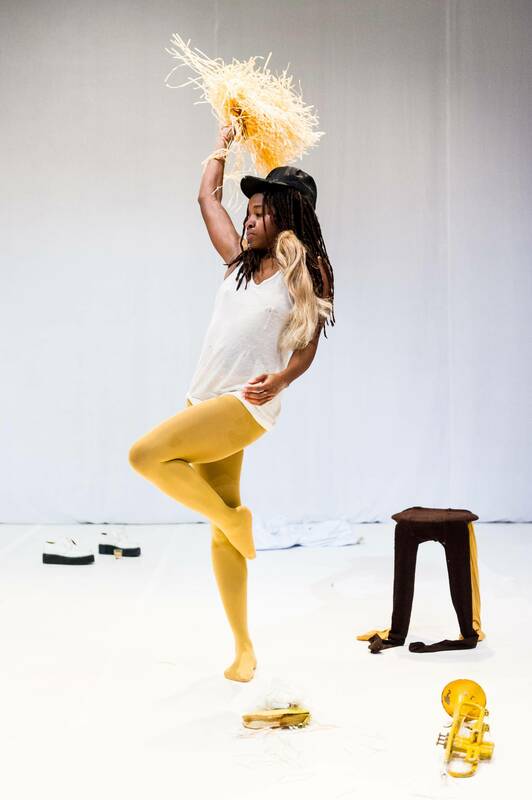 The Ottawa-born choreographer is talking about Yellow Towel, her much-lauded solo work that will have its Toronto premiere at the inaugural Dancemakers MiniFest, which opens next week. "It seems ridiculous," she adds, "but it was a huge step, and it continues to unfold." The work has become something of a signature piece for the Montreal-based Michel; over the past four years, it's toured to 50-odd cities across Europe and the United States, and garnered high praise from the likes of The New York Times and Time Out New York. It's heavily autobiographical – the title refers to a towel Michel would put on her head as a child to become "blond." "It's a realization of just how deep an effect assimilation has had on my life and my outlook – on how I presented myself and on ideas that I dared to share, both personally and artistically." The accolades continued this past March, when Michel got a phone call from renowned Canadian choreographer Marie Chouinard, the new director of dance at the Venice Biennale, where the piece will be performed later this year: Michel had been awarded the festival's prestigious Silver Lion for Innovation in Dance. "It was a complete shock," Michel says of the call, which she received just after dropping her son off at daycare. "I think my jaw dropped onto the road." Despite the international attention, Yellow Towel hasn't actually been seen much in Canada, something that the MiniFest will rectify a little. Dancemakers curator Amelia Ehrhardt explains that the festival was born out of what initially looked like an awkward scheduling coincidence. The 43-year-old dance company is based on a system of three-year artist residencies, and two of the key residents, Michel and Melbourne-based choreographer Antony Hamilton, were going to have work ready to show at around the same time. "We were looking at a back-to-back two-week period of our two main productions of the year – a marketing nightmare!" Ehrhardt says. But necessity being the mother of invention, she realized it was a great opportunity to invite the company's two emerging-artist residents, Amanda Acorn and Andrea Spaziani, to present new work alongside the more-established artists. And so the new initiative was born. Ehrhardt is relatively new at the helm of Dancemakers – she became curator in 2016 after a short joint tenure by Benjamin Kamino and Emi Forster. The company has always been a bit of a wild child on the city's dance scene, presenting challenging, exploratory, forward-looking material. Ehrhardt, who was the curator for the inaugural dance chapter at the SummerWorks festival, is thoughtful and articulate, with a breadth of knowledge on contemporary dance and performance practice. She's committed to the idea that experimentation and research should guide the development of new work. This means Dancemakers' programming can demand a lot from its audience – a welcoming demand, no doubt, but I sometimes feel that a pre-existing foundation in the discourse around performance and theory is needed to get a lot out of the company's work. It can make the audience a bit niche. Dancemakers is located in the city's trendy and touristy Distillery District, and Ehrhardt tells me the few times that patrons have wandered from the shops into their shows, they've left a bit bewildered. With the discussion around race evolving so rapidly in the past few years, Michel says Yellow Towel is always changing with it. Now in his second-year of the Dancemakers residency, Hamilton has been developing a piece featuring Toronto-based dancers Michael Caldwell, Jolyane Langlois, Tia Kushniruk and Sahara Morimoto, called Natural Orders, that will be co-presented by the MiniFest and the Luminato Festival. It continues to explore a theme that was present in Meeting and has fascinated him for some time: the synthesis between constructed and natural worlds. "We tend to think of anything that humans make as artificial in a way, and anything else as belonging to the natural world – it sort of positions us in a very unusual place," he says. By that logic, "humans become almost supernatural, which we're not." Hamilton also likes to approach his work with an incidental spirit, using the objects that just happen to be around. "I'm more and more interested in responding to the reality of the situation you're in and not sort of overdressing it with other things. We often don't look at what's right in front of us," he says. "Antony is really interested in a conceptual and formal clarity," Ehrhardt says. "It's superdistilled. Dana, on the other hand, is committed to the mess." When I mention this "mess" to Michel, she laughs and says that Ehrhardt is probably talking about the literal disorder she's walked in on in the studio. "When I'm making a work, I'm really motivated by materials and textures. It's what triggers me the most, acquired materials and seeing how I connect with them, what they can say about my life. I like creating little worlds for myself." She adds that it's an odd feeling not to have performed Yellow Towel in Canada that much, since the piece is based on her childhood here. She's excited to bring it to Toronto, considering the city's large Caribbean community (Michel's parents are from St. Lucia and the piece dissects a lot of related black stereotypes). With the discussion around race evolving so rapidly in the past few years, Michel says Yellow Towel is always changing with it. "I feel like I'm in a train riding alongside that conversation." Dancemakers MiniFest runs from June 13-24 at various Toronto venues (dancemakers.org).